Palli Karma-Sahayak Foundation (PKSF) organized the ‘Scholarship Awarding Program’ at PKSF Bhaban, Agargaon, Dhaka on May 11, 2017. 3,424 poor and meritorious students were delivered cheques of financial assistance to continue their education. 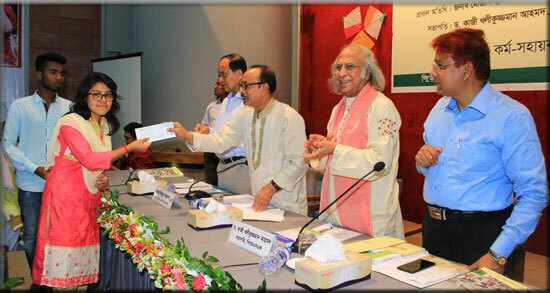 The total amount of scholarship of BDT 4.11 crore (approx.) was allotted from the Programmes-Support Fund of PKSF. Each student received an amount of BDT 12,000. 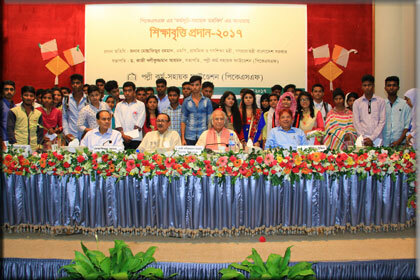 The programme was chaired by Dr. Qazi Kholiquzzaman Ahmad, Chairman, PKSF, while Mr. Mostafizur Rahman MP, Hon’ble Minister for Primary and Mass Education was the chief guest. Mr. Md. Abdul Karim, Managing Director of PKSF delivered the welcome speech. Dr. Md. Jashim Uddin, Deputy Managing Director (Admin. 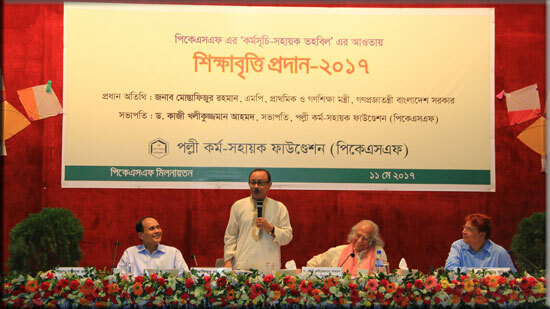 ), PKSF made a presentation on ‘PKSF in Education’. Mr. Mostafizur Rahman MP, Chief Guest, appreciated PKSF’s contribution to the cause of the underprivileged children. Accesses to health care, education and social development activities are preconditions to establish human dignity of the poor. PKSF initiated the Programmes-Support Fund (PSF) in 2011 in order to ensure such accesses. Till now, a total of 8,671 students have been given scholarship worth BDT 8.57 crore from PKSF’s Programmes-Support Fund.